If Jesus Goes With Me 1-6 It may be in the valley, where countless dangers hide; It may be in the sunshine that I, in peace, abide; But this one thing. 2 If Jesus Goes With Me 2-6 If Jesus goes with me, Ill go. (Ill go.) Anywhere! Tis heaven to me, Where eer I may be, if He is there! I count it a privilege here. 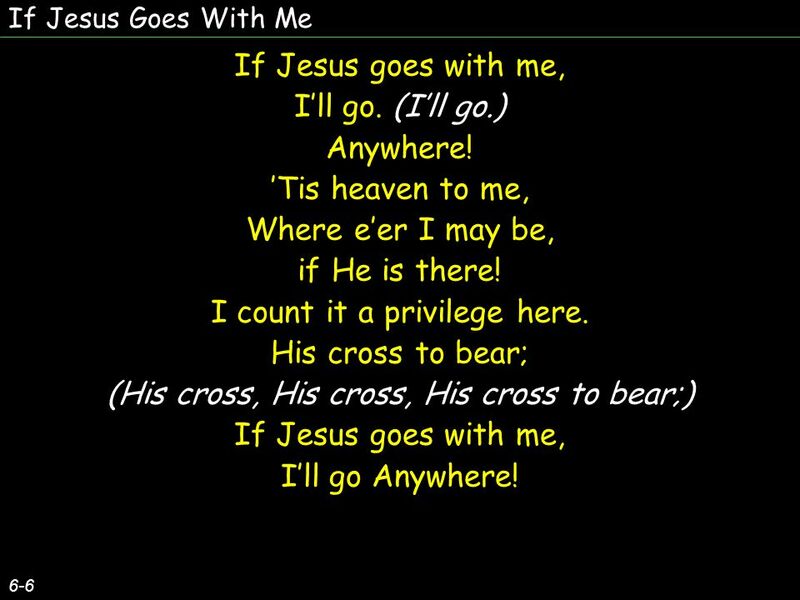 His cross to bear; (His cross, His cross, His cross to bear;) If Jesus goes with me, Ill go Anywhere! If Jesus goes with me, Ill go. (Ill go.) Anywhere! Tis heaven to me, Where eer I may be, if He is there! I count it a privilege here. His cross to bear; (His cross, His cross, His cross to bear;) If Jesus goes with me, Ill go Anywhere! 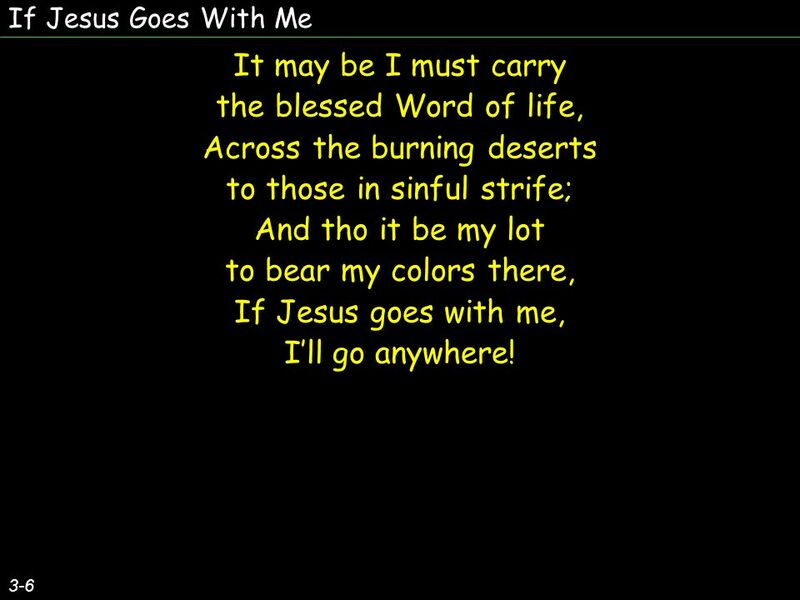 3 If Jesus Goes With Me 3-6 It may be I must carry the blessed Word of life, Across the burning deserts to those in sinful strife; And tho it be my lot to bear my colors there, If Jesus goes with me, Ill go anywhere! It may be I must carry the blessed Word of life, Across the burning deserts to those in sinful strife; And tho it be my lot to bear my colors there, If Jesus goes with me, Ill go anywhere! 4 If Jesus Goes With Me 4-6 If Jesus goes with me, Ill go. (Ill go.) Anywhere! Tis heaven to me, Where eer I may be, if He is there! I count it a privilege here. His cross to bear; (His cross, His cross, His cross to bear;) If Jesus goes with me, Ill go Anywhere! If Jesus goes with me, Ill go. (Ill go.) Anywhere! Tis heaven to me, Where eer I may be, if He is there! I count it a privilege here. His cross to bear; (His cross, His cross, His cross to bear;) If Jesus goes with me, Ill go Anywhere! 5 If Jesus Goes With Me 5-6 It is not mine to question the judgment of my Lord, It is but mine to follow the leadings of His Word; But if to go or stay, or whether here or there, Ill be, with my Savior, content anywhere! It is not mine to question the judgment of my Lord, It is but mine to follow the leadings of His Word; But if to go or stay, or whether here or there, Ill be, with my Savior, content anywhere! 6 If Jesus Goes With Me 6-6 If Jesus goes with me, Ill go. (Ill go.) Anywhere! Tis heaven to me, Where eer I may be, if He is there! I count it a privilege here. His cross to bear; (His cross, His cross, His cross to bear;) If Jesus goes with me, Ill go Anywhere! If Jesus goes with me, Ill go. (Ill go.) Anywhere! Tis heaven to me, Where eer I may be, if He is there! I count it a privilege here. His cross to bear; (His cross, His cross, His cross to bear;) If Jesus goes with me, Ill go Anywhere! Download ppt "If Jesus Goes With Me 1-6 It may be in the valley, where countless dangers hide; It may be in the sunshine that I, in peace, abide; But this one thing." I was once a sinner, but I came Pardon to receive from my Lord. My Jesus, I Love Thee Note: Thee = You in Old English. He Leadeth Me He leadeth me! O blessed thought! O words with heavenly comfort fraught! Whate’er I do, where’er I be, Still ‘tis God’s hand that leadeth. O The Deep, Deep Love Of Jesus O the deep, deep love of Jesus, Vast, unmeasured, boundless free! Rolling as a mighty ocean In its fullness over me. #194 Alas! And Did My Savior Bleed Alas! and did my Savior bleed And did my sovereign die? Would He devote that sacred Head For sinners such as I? #194. What Is He Worth To Your Soul? 1-4 Jesus the Lord laid His glory aside, Sinners to save and make whole, Freely He died our transgressions to hide, What. Beneath the Cross of Jesus Beneath the cross of Jesus I fain would take my stand- The shadow of a mighty Rock Within a weary land; Beneath the cross of. Make Me a Blessing 1. Out on the highways and byways of life, Many are weary and sad; Carry the sunshine where darkness is rife, Making the sorrowing glad.